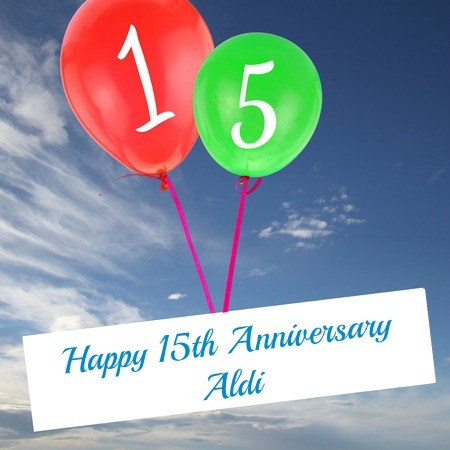 Debt Free, Cashed Up and Laughing - The Cheapskates way to living the good life: Happy 15th Anniversary Aldi! Today marks the 15th anniversary of Aldi opening in Australia. That 15 years has just flown by. I remember watching A Current Affair with great interest, and seeing the opening of the first store in Sydney, hearing what people were saying about the products and more importantly the low, low prices and wishing I was there. Most Australians were wary of this unknown, privately owned and very secretive German supermarket. But we all like a bargain so on opening day it was almost a stampede as shoppers flocked to be amongst the first to sample unknown products and prices. I remember being almost green with envy at the prices and just busting to try Aldi out. I remember being so excited when the Chirnside Park store opened here in Melbourne. It was still a distance to travel, but not so far that it was unreasonable. I didn't go the first day, but I was there the very next. And I've been an Aldi convert ever since. Not long after the Ferntree Gully store opened I took my mother for her very first Aldi shopping experience one Friday morning. Hannah still goes into hysterics at Grandma's reaction at the checkout. "ALL THAT! YOU GOT ALL THAT FOR $86! ALL THAT!" And yes, she was shouting - she was more excited than I was. My grocery budget was tight and $86 for a month's worth of basic grocery items (flours, sugar, wheat biscuits, pasta, butter, milk, tinned tomatoes, tuna etc.) meant I had wriggle room in my grocery budget for the first time in over 10 years. And shopping at Aldi still gives me wriggle room in my budget. Without Aldi's low prices, great range, amazing special buys and incredible 7 Day Deals we wouldn't be able to stick to our super-tight, extra stringent budget this year. I am asked every week whether or not I really think Aldi saves shoppers money or is good for Australia. The answer is a resounding "YES" to both questions, so much so that I've run workshops based on Aldi shopping lists. I'm running a workshop just on Aldi in Adelaide in February - Aldi will be opening in Adelaide on 3rd February. I'm a very proud and loyal Aldi shopper and I am so very grateful you came to Australia. I can't wait to see how much I save over the next 15 years. I used to go to Aldi a lot when we were in Germany. I should visit the one here more often. Cath I too love Aldi but have had a problem with the way the new store that I want to go to is set up - things on the top shelves are packed one on the other and for some people it is a case of not being able to reach the items required OR something falling on them as they tilt the box forward. I am left with going back to my old Aldi because of the safety factor - my take on the situation is that they really do not care as long as I am buying from them - can you help? Oh and yes I have shopped Aldi in both states we have lived in since they arrived on the scene. Where can I find details about the Aldi workshop you are going to run in Adelaide please? Ah, you love to torment us West Aussies. We've only got one Aldi, in the Perth metro area, and as we live in Albany, it's not cost effective to go there. There is one opening next month in Australind, which is near Bunbury where my son lives, so I might have to visit and bring home a bootful of needful things. My sister has just moved from Warwick in Qld, and she misses going to Aldi, they used to shop there all the time and over the years have also got many household goods as well. Grump, grump. I like to support Australian owned and made products, so as to keep our money in Australia. Our government have implemented very stringent laws for our farmers so that we have safe, and good quality foods and our farmers pay highly for this quality control. Also our money creates jobs for Australians. I believe in being thrifty but not at all costs. If we want employment we need to have industry here.